Today is the latest iteration of the Black Friday phenomenon, with ordinary people rushing to store to cash in on the best deals, spending their hard-earned money. The usual smears of ‘crass consumerism’, ‘materialism’, and ‘crude capitalism’ will, of course, be thrown around as commentators lament the state of the world. But if only every day were like Black Friday! To criticise Black Friday as ‘consumerist’ is, to use a philosophical analysis from Ayn Rand, a package deal. It is thrown around at such times as Black Friday and Christmas to lament the state of society, to express moral indignation at the sight of people using the money they have earned through the year to try and improve their lives in a material fashion. A package deal is used as an attempt to label two distinctly different ideas as the same thing. The smear of ‘consumerism’ attempts to label mindless materialism and voluntary trading as the same, immoral phenomenon. This is to say, if you use any of the deals on offer on Black Friday, you are engaging in a mindless, immoral activity, and you ought to be condemned for it. However, the freer people are from government control, the less money they have to pay in terms of taxes and regulations, the more they are able to trade with each other, to buy things for themselves, to improve their own lives. 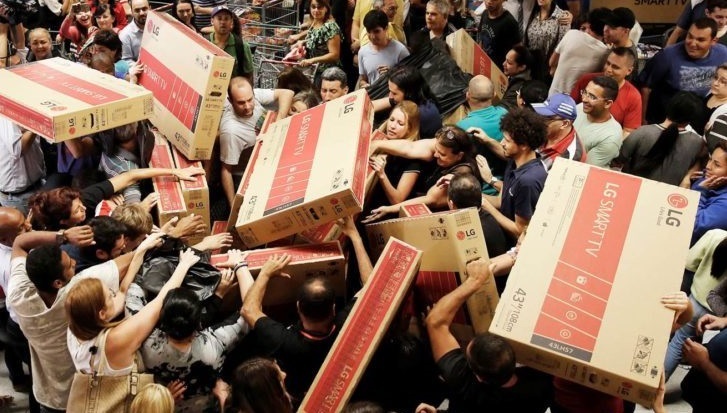 Black Friday will witness millions of people trading with each other, deciding how they want to spend their money on things which will make their lives materially better for them. Canada’s Fraser Institute, in partnership with the South African Free Market Foundation, publishes the annual Economic Freedom of the World (EFW) report. The report measures how free people are to pursue their own economic interests without interference. The latest EFW report ranks South Africa at 110 out of 162 countries. Across the five categories used in the index, SA has been dropping consistently over the years. This latest index is based on data from 2016 (the most recent year of available data) and measures the economic freedom of 162 countries and territories for which data are available. A slide down the index indicates that countries are becoming less free and are heading towards having lower incomes, greater poverty, more inequality, reduced life expectancy, fewer political rights and liberties and generally bleak prospects for the quality of life. The less economic freedom the people of a country have, the more controlling that country’s government is. When the size of government is large, for example, the government takes a bigger slice of the economy, which means there is much less private sector investment and real job creation. The biggest drops for SA have happened in the “Legal System and Property Rights” areas of the index. The Constitutional Review Committee has recommended that the Constitution be amended to allow for expropriation without compensation, which means that investor confidence is likely to slump, and cause SA’s property rights ranking to decline even further, discouraging both local and international businesses from investing in SA. Our current unemployment rate will pale in comparison with what it will be in future. Improving in the EFW’s five categories is an easy way for governments to increase the freedom of their people. Yet, every year, government seems determined to do the exact opposite of what EFW recommends. Some have criticised Black Friday for supposedly entrenching ‘American culture’ in South Africa, whereas others have condemned the phenomenon for inducing shoppers to spend money they should instead be saving. But it is worthwhile noting that the latter critics usually do not condemn the multitude of taxes and compliance costs ordinary South Africans spend daily to feed our oversized State bureaucracy and its vanity projects. To be clear, this is not to endorse the Keynesian fallacy that spending – especially government spending – generates economic growth. But being able to spend more of one’s money on what one wants – as opposed to having it spent on one’s behalf on something one does not agree to – is the hallmark of a healthy, free economy, and because Black Friday is the one day every year that South Africans, at least, feel free to do so, it should be celebrated. The closer to total economic freedom South Africa ranks in the EFW report, the closer we’ll be to celebrating Black Friday every day; with South Africans having more money to spend – or better yet, save, and spend later on more worthwhile assets – and to improve their lot in life. Let’s hope the joy that South Africans experience today as free consumers will rub off on government and induce it to pursue economic freedom. Hattingh has a degree in business ethics and Van Staden in law.